Hi everyone! My name is Jenn and you can find me over at Momma D and Da Boyz. 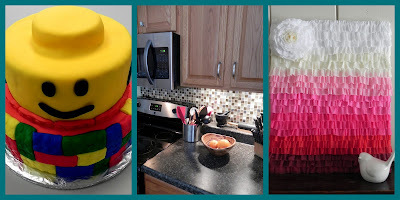 I am the stay-at-home mom of four sons and I write about my life with five men, DIY as we renovate our house, cake decorating and of course crafts. I am excited to be here at Jessica’s blog with my contribution to the Mad for Mad Men series! When I first heard about this blog series I was deciding what inspired me. As a stay-at-home mom and housewife, I thought about Betty Draper. Now don’t get me wrong, I am not saying her aloof and standoffish form of mothering is what I wish to emanate. But her outfits are amazing. The dresses with underskirts. The gloves and purses. And even the perfection of her riding outfits. Because it is made of tulle, it truly is the most impractical fabric for keeping one clean! But I loved the idea of a tad bit a chic over practicality. So I headed to my local Joann’s and searched through the pattern books. My favorite ended up being McCall’s 5825. This pattern actually has lots of variations you can choose. But I decided to do the "B" option. I liked how it had a primary cotton apron, and a second tier I could make out of a sheer fabric. So I picked a cotton in a modern yet retro feel print and a coordinating colored organza. The pattern was easy to follow. Let me just say, I am self taught. I learned to sew while working on my boys’ Halloween costumes. So just go slow and you’ll be fine! And cut out my pieces. I was set to start the sewing. There is a lot of hemming. Both the upper and lower apron pieces need to be hemmed on three sides. Working with cotton is pretty normal and run of the mill. It is easy to press it with an iron, it sews without a problem. Organza is difficult. Seriously difficult. It tends to pucker when you are sewing. To combat that a little I was sure to pin precisely, sprayed with starch and then ironed it. It kept things neat and quite a bit easier. Then my favorite part happened. …and then the bottom layer. Right about here is when I started to fall in love with the project, the contrast of the the dark brown and the golden color. The one very special detail was this pocket. It is unique and super cute! Just a few shots of the finished apron. I kind of adore it. Momma D as Betty Draper, but ya know…outside by my barn and not in a fancy dining room. But that’s how I roll! I hope you’ll stop by and visit me at Momma D and Da Boyz and check out things like my newest cake, a Lego Themed Tiered Cake, or our DIY Kitchen Backsplash. And of course the crafts! Like my Ruffled Crepe Paper Streamer Ombre Art. Thanks again Jessica for inviting me to be a part of the Mad for Mad Men event! A big thanks to Jennifer for this fantastic tutorial. I love aprons and broke down and finally bought myself one earlier this year, but now I am going to have to work on learning to sew one! Pay a visit to Jenn’s blog, Momma D and Da Boyz, for more great ideas. Hi there. I am interested in your cute Betty Draper apron. The website says you have a free pattern. All I could find were the pictures and your directions but no pattern. Am I missing something? Thank you! This was a guest post from Momma D and Da Boyz. You might be able to find the pattern on her site! Hope this helps.